William Ellis Palmer was born to William Ervin Palmer and Klea Washburn January 27, 1934. He was the third son and fourth child. Because the two oldest boys died as infants, he assumed the role of the first son. Ellis grew up with a lot of responsibility. In spite of dealing with asthma and poor health as a child, he grew up to be healthy and strong. He gained his education in Blanding. Ellis grew up showing his leadership skills through various church callings and as Student Body President of San Juan High School. He graduated in 1952. His classmates were his lifelong friends. His musical ability was discovered by his neighbor. He would sing as he milked the cows. His neighbor heard him, so she told Reva Redd, who was the music leader at school. These neighbor ladies hid in their barn so they could hear him sing. That was the beginning of his career as a public singer. Music brought Ellis and the love of his life together. He acquired his life long accompanist, our mom, Mabel June Hurst, in the Manti Temple on June 7, 1954. He was inducted into the army on January 5, 1953 with his good buddy Calvin Blake. His service in the army gave him a deep feeling of patriotism, as displayed by his love the flag. Upon his release from the army, Ellis resumed the career he had in high school of working in the uranium mines--a vocation he followed until 1961. When mining failed, he found a job working at Parley Redd’s Merc for the winter; that winter lasted him 37 ½ years until he retired. When his father died in 1974, he and his brothers Philip and Don inherited the Verdure Ranch. Ellis and Philip worked the ranch together until Philip passed away and dad’s health began to fail, at which time, their sons took over the Ranch responsibility. Dad and Philip were best friends and had total confidence in each other and never had an argument. Throughout the years, he has served as counselor in the Bishopric. He has served on 3 High Councils under 3 Stake Presidents. He loved serving in his Priesthood Quorums. He was a very faithful home teacher. His service to and his caring for others cannot be measured. He loved hunting, fishing, collecting knives, and working in his yard and the field or Ranch. He loved cookouts with family and special friends. He loved rocks of all sizes. Of all the things he loved, his greatest treasures were his children. Ellis passed away in the Pinnacle Health and Rehab center in Price, under the loving care of their amazing staff on March 14, 2019. He is survived by his loving and devoted wife of nearly 65 years, Mabel June. His children Shirley (Bruce), Wayne (Renee), Sally (Ken), Tom (Karie), Clayton (Kim), 22 grandchildren, and 62 ½ great grandchildren. He was preceded in death by his parents, Ervin and Klea; his brothers, Gordon, Max, Philip, Lyle and Don; one sister, Nadine Bayles; and one granddaughter, Tina Fessler. 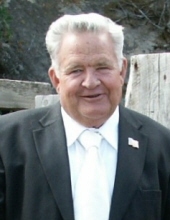 Services for William Ellis Palmer will be held at the Stake Center (88 W 800 N) in Blanding, Utah on Friday, March 22, 2019. The viewing will be held from 9-11:30, with the funeral service to follow at 12:00. To plant a tree in memory of William Ellis Palmer, please visit our Tribute Store. "Email Address" would like to share the life celebration of William Ellis Palmer. Click on the "link" to go to share a favorite memory or leave a condolence message for the family.